I'm back with some sales! Many old hasbro and figures! Please look! Long time huh? Well i had a death in the family so life's been rather, hectic :( so i dissapeared for a while. But i need to move some items, because I just dont have room, and NDK is coming up and I want to enjoy the shopping :D.... I have a bunch of items i need to sell, and i'm wondering should I sell my extra kids and tomy's as a lot on ebay or seprately here? I EXPECT PAYMENT WITHIN 24 HOURS! NO EXCEPTIONS IF YOU CAN NOT PAY NOW DO NOT COMMIT TO BUY. I reserve the right to change prices as I see fit, as they are from my personal collection, I might even take items away! I also have a cat and a 1 year old, so things might happen to the items from the time I list them to the time you buy them, things happen, and I will refund you the money if something were to happen to the item in question. SORRY NO TEASER PIC, I HAVE NO TIME TO DO THAT <3 just take a look! Hi, it 's a quick question about the Abra line zukan. I am wondering if the Japanese version one has different material from the European one's. Cuz I just got a European one and the material is kind of soft and different than the material of my other zukans. Nearly all of the Mixed plush GA packages have been shipped Friday and Saturday, but I am still awaiting a few payments. nigelpkmn and rhys107 If you are reading this, please reply to my previous comments asap! GA participants you may check the spreadsheet to see when yours was shipped (Picture above links back to Payment 2 post and spreadsheet is in the post). Non-US buyers, please allow 2-4 weeks for your package to arrive after its shipping date. Hi everyone! 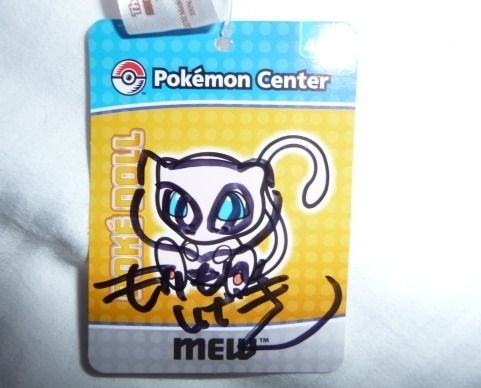 This is the last reminder that my auction for worlds items and signed pokedolls from Shigeki Morimoto (Mew), Junichi Masuda (Flareon), and Tsunekaz Ishihara (Latias) ends tonight in just 13 hours! Click the link below or the pictures to be transported to the auction! Hey everyone, this year Yelsha42 and I attended the Pokemon World Championships! 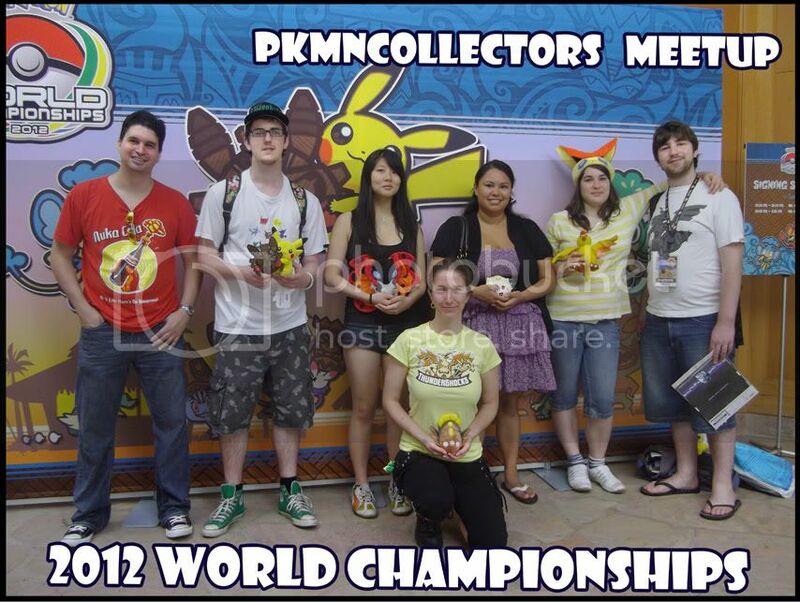 I have some photos to share with you of the event, the merchandise and the pkmncollectors meetup!! Also, we want to get ALL of this year's World's merch. We're especially interested in obtaining some of the decoration (foam cutouts, signs, banners, playmats, etc.) from the event. If anyone knows someone who has some of the decorations and wouldn't mind parting with them, please let me know!! Below is all the merch we managed to get. 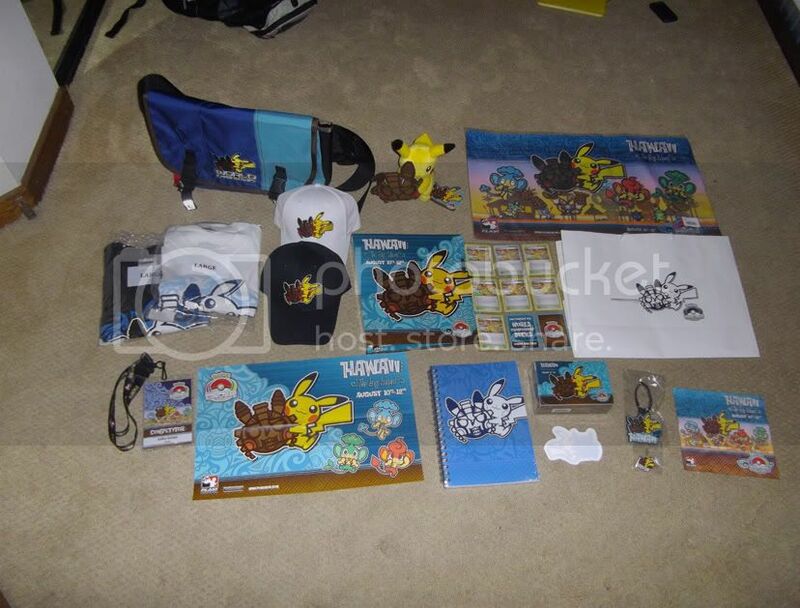 There's the shoulder bag, the tikichu plush, playmat, black and white shirts, black and white hats, binder with World's promos, gift bag, competitor tag (staff, press and other age division tags are on their way to me in the mail), poster, notebook, deckbox, tattoo, luggage tag, pin and screen cleaner. And I also made a montage of our week, including the World Championships but also of some of the other things we did while we were on holiday! Hey guys, i have gathered a bunch of miscellaneous flats and I want to cut them down. I'd rather just give them out instead of having them sit around or throwing them out! So there is a huge freebie section, along with a few other things, added to my sales. Shipping for flats is $1.50 for US and $2.50 for International! Click here or the banner to go. Additionally, I have decided to auction off my Glaceon Joint Palace Figure, along with a stack of 141 Common + Uncommon cards from Rising Rivals. I was granted sales permission by lineaalba in 2008. My feedback thread is here. GYM LEADERS AND CHAMPIONS OH MY! MAJOR COOL SURPRISE MERCHANDISE NEWS!!! This news is thanks to our Osakain member Peka on Twitter!!!! EDIT: now with better pics also from peka!! Pokemon Center has sprung an unexpected release on us. 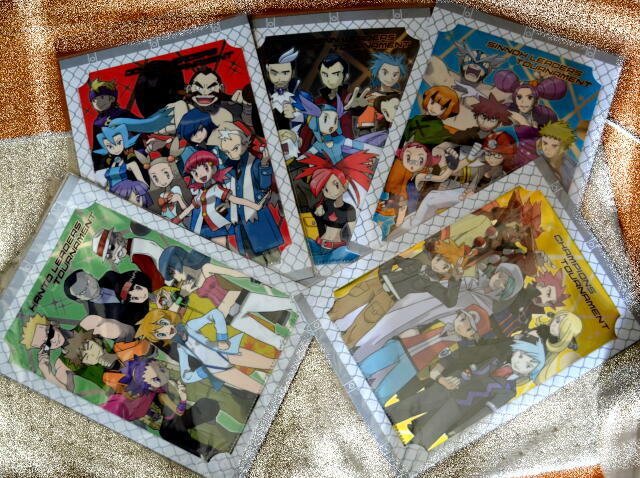 Clearfiles featuring every Gym Leader and/or Champion (Unova not included in the Gym Leader sets but we can't complain) and each one includes an entire eight bookmark set with each individual and their main partner Pokemon!!!! I am SO EXCITED! I've stocked them instantly and have to go get my sets tomorrow!!! Here I come Lt. Surge!!! Gym trainer Clear file and bookmark set! long time no post.. Do you remember me? I'm PEKA. bibarel collector! some pictures of the GA and more. Ok, so if you haven't seen my edit in the last post yesterday, I have officially decided I will post the extras for sale from the GAs AFTER I have shipped out everything that was already bought in the GAs. This is because 1. I have already sealed all the items ready to ship. and 2. It's college crazyness and I want to just get these packages shipped out before I move onto extras sales. They WILL be coming though. I've already taken pics of them ALL. So expect the extras sales post around wednesday or thursday. 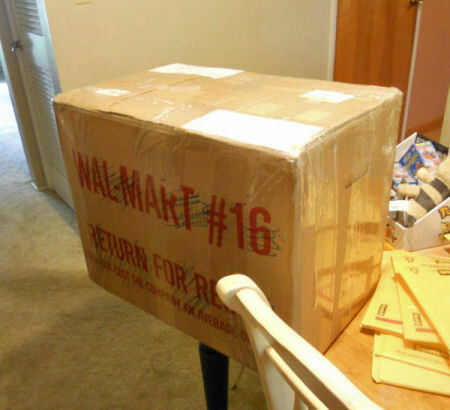 Next, when you receive your items, please check that they are all there. I did double check myself already but with this massive amount of stuff there may have been 1 or 2 mistakes. If you find you are missing an item, simply give me a link to your thread in the GA and prove that you did indeed win that item, and I will gladly ship it out to you FOR FREE for my mistake. I'm hoping this won't happen, but you never know. All items are sent out EXACTLY as I received them, please remember that. Again, PLEASE don't contact me about leaving feedback. I PROMISE I will leave feedback for EVERYONE in these GAs, just give me time to get everything else settled first. There are still a few people who need to pay payment 2, you can find this list under the cut. Remember, you have until tuesday to pay to get your item(s) shipped out in the first round, and you have a week to pay before I leave negative feedback. Anyway, if you live in the greater Vancouver metropolitan area/visit often and you haven't checked out the gachapon place yet, you realllly should. It's pretty awesome! So I wasn't going to buy a box but chaosoftwilight convinced me. With the nice pulls, I'm really kinda glad I did! I think this is the most pulls I've gotten from a box. Added a few more things so feel free to add card order with my regular sales! - Please do not ask when I will ship your package, everything can be found in the rules under SHIPPING! - Do NOT ask for a quote if the starting shipping price is too much for you to pay!!!! Introduction! Edit: and Glaceon kid want! Hi Pokémon Collectors! Some questions and sales today. Okay, so school is starting soon and I just got a new backpack! And, I want to decorate it with my favorite Pokémon. Does anyone have any ideas? I'm thinking badges or pins, but what else is out there? On that note, does anyone have a Zoroark AEON badge/a picture of one or can get one/get a picture of one? XD It's highly likely that I want to buy one, but I missed out on Gin's pick ups! Also, I'm not sure if it's too early, but is anyone doing pick ups/reserving slots for the large I <3 Eevee Eevee plush yet? and really. most are veeery very cheap. i need to get all these things out out out before i move (for mula and for my sanity). 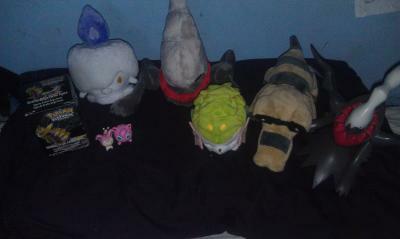 plush, kids, lil' figs, books, stickers... all that random shtuff. 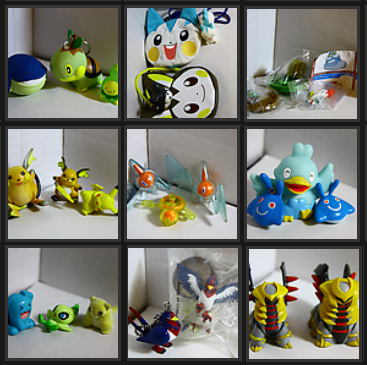 Auction end at Wednesday, 22th August at 11:59 pm (Hong Kong time/GMT+8)! It's about Wednesday afternoon in the US timezone. Schenzi 400 kids GA won! Hi guys, good news! We won the GA! Aaand there will be a discount! Please stop bidding on it. Please don't start messaging me about Payment 1 - I deserve some weekend too - It's going to be absolutely Hellish doing a 300+ item spreadsheet, so I am not starting until Monday morning. I promise Payment 1details will be ready very soon. Hopefully tomorrow. I have accepted all starting bids placed after the end time, but no bids against other members. This is because I don't want to have 100 spare toys in my house. The more claimed, the better! There are leftovers. I am going to eat them offer some free as long as it doesn't knock your postage to the next price up. If there's something specific you missed and want, then you should have bid on it. I can combine with the Pokebox orders as long as you understand that will take a while. Postage (Payment 2) will take place in waves due to the amount of participants. I know you're sick of waiting. I know! I am not a wizard, and I can't do anything about this until it arrives! I promise you the very minute I have any news, I'll be on here shouting from the roof! Also, I have spoken with a couple of moderators and I am not responsible for this delay so far as feedback or Paypal is concerned - I should not receive negative or neutral feedback due to this delay, as it is out of my hands entirely. I will ship these as soon as they arrive, at which point I am responsible for the handling. auctions and a collection update! Updates and auctions and sales, oh boy! 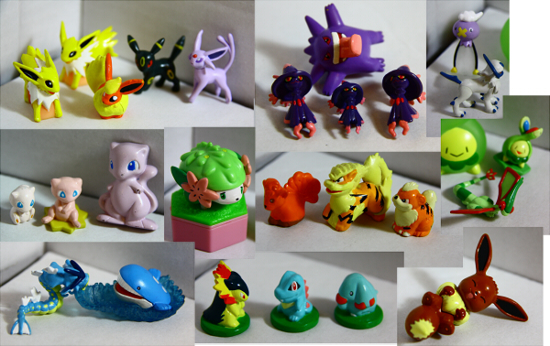 I have several large plastic figures and their mini rubber counterparts up for sale/auction today, along with a custom Vulpix, talking Marill, and a Totodile plastic standee! Click HERE or on any of the photos to see the auctions! 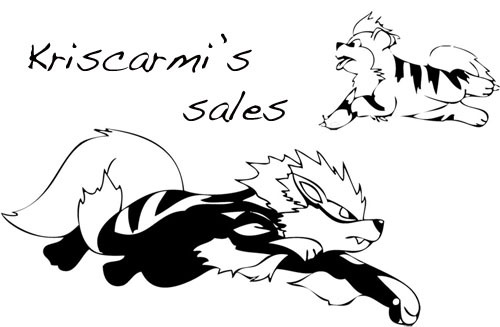 I also have a couple new things in my sales post, which I'd be happy to combine with auction stuff! C: As always, feel free to haggle/make offers/suggest trades! And now for the best part! Collection update!! Whales and foxes and snakes! New here! Love Plushies to no end! This is all I have so far! I have a REAL Pokemon Center Victini coming in the mail. I'm an artist. Top of my class. Video gaming is my life. I loved pokemon since I was a kid. 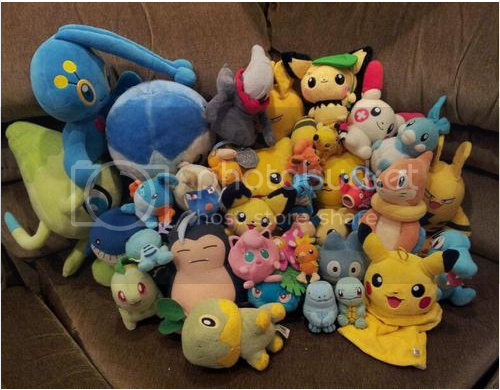 I still have my talking Pikachu somewhere... Anyways I'm looking for a few more plushies. Thats about it. Mostly looking for Jirachi, Deoxys, Arceus, and Giratina right now. I only have 84$ and I really don't want to spend all of it on theses guys. I really only wanna spend like 40-50$ at most. These are my top priority!